Join us for a free seminar on covering the rise in hate crimes and clashes. 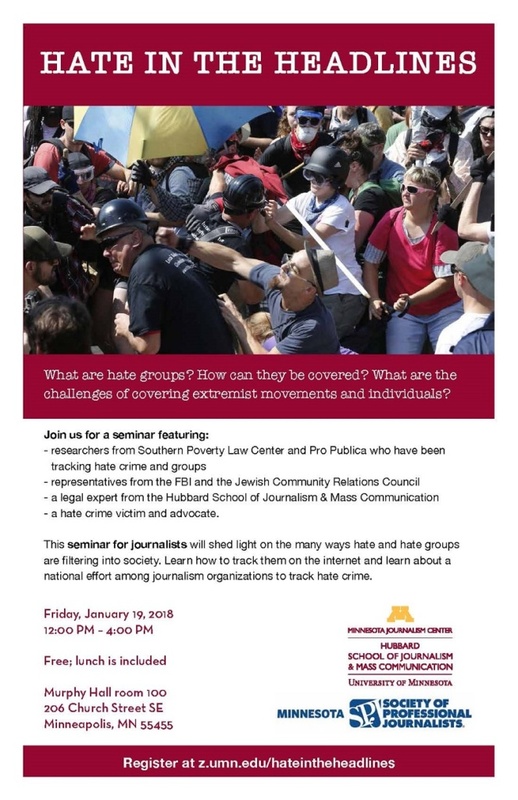 On Friday, Jan. 19, MNSPJ and the Minnesota Journalism Center will host “Hate in the Headlines,” an afternoon workshop at the University of Minnesota. Dig into the latest research on this timely topic from the Southern Poverty Law Center and ProPublica. Hear from law enforcement, legal experts and victims of hate crimes. You won’t want to miss this valuable training! This workshop is free. But space is limited, so registration is required. Register online at z.umn.edu/hateintheheadlines.